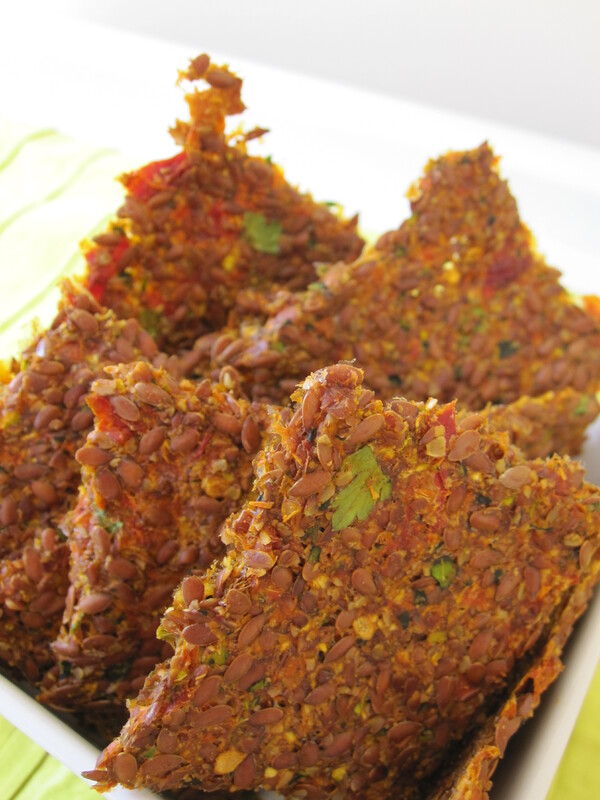 I absolutely love making and eating Pizza Crackers – in fact I love all Flaxseed Crackers. With only the one flaxseed cracker recipe on my website so far I figured it was time to post a new cracker recipe and this one is a goody! The night before, put your flaxseeds on to soak. Grind you 1 1/4 cups of flaxseeds in a food processor, blender or mill and set aside. In a large food processor place all the ingredients except for the flaxseeds and the fresh herbs. Process all the vegetables and spices together until smooth. Add the ground flaxseeds and soaked flaxseeds and pulse until combined. Add your fresh herbs and pulse until chopped. Spread about 2 cups full evenly on a lined dehydrator tray and smooth over the tray as thin as possible (about 4ml). Makes 3 trays of crackers.